Don’t forget to visit our blog at www.cajunstitchery.blogspot.com, and www.cajunstitchery.etsy.com often. We are also on Twitter and Facebook. Ha! The round monogram never needed to be washed. It turned out that when I digitized it, I forgot to put underlay stitches. Once the underlay stitches were placed, the fabric didn’t show through. The customer picked it up this week and just loved it. Every time my son called me this week, I answered the phone, “Do we have a baby yet?” So far we don’t have a baby. The due date is August 2nd. So, any day now we will be great grandparents. My granddaughter is ready for this baby to come into the world. She is very tired. On a very sad note, a dear friend has been hospitalized. She had some aches and pains that seemed to commence during the Mardi Gras season. She just thought it was bursitis. However, the pain not only has not subsided, but has increased. When she went to her doctor’s appointment earlier this week, he put her in the hospital to do some tests. It turns out that she has multiple myeloma. That is cancer. She is still hospitalized and has begun chemotherapy. She is one of those totally happy people who walks into a room and creates a glow; always cracking a joke; always has a smile on her face. Please pray for our friend, Lois. A young lady from Michigan called me the other day inquiring about a handkerchief. Apparently, she was doing some searches on the internet and ran across the blog from July 28, 2010, entitled “Wedding Handkerchiefs and Benefits of Ammonia.” Now that is a quirky title. What was I thinking? Nevertheless, she is getting married on August 10th and wanted a special handkerchief for her godmother. I made the handkerchief and she is delighted. It will be mailed tomorrow or Monday. This hanky was made entirely in-the-hoop (ITH). Now that I have the large hoops, a 10” handkerchief is a piece of cake. The poem was a bit more difficult but ended up lovely and just what she wants. The edges were not serged as usual. Instead, the edges are a beautiful white satin stitch. Three Cajuns go down to Mexico to celebrate their college graduation. They get very drunk and wake up in a Mexican jail, only to find that they are to be executed in the morning, though none of them can remember what they did the night before. The first one, Henri, is strapped in the electric chair, and is asked if he has any last words. He says, "I just graduated from Nichols State in Thibodaux, Louisiana, and I believe in the almighty power of God to intervene on the behalf of the innocent." The Mexican jailers throw the switch, and nothing happens. The Mexicans immediately fall to the floor on their knees, beg for Henri’s forgiveness, and immediately release him. The second Cajun, Gaston, is strapped in and gives his last words, "I just graduated from McNeese State in Lake Charles, Louisiana, and I believe in the power of justice to intervene on the part of the innocent." The Mexican jailers throw the switch and again nothing happens. Again, the Mexicans all immediately fall to their knees, beg for Gaston's forgiveness, and immediately release him. The last Cajun, Boudreaux, is strapped in and he says, "Well, den, I'm from de University of Louisiana in Lafayette and I just graduated wit ma degree in Civil Engineering, and I'll tell you rat now, you boys ain't never gon' be able to electrocute nobody if ya'll don't plug dis damn ting in." I sure hope everyone has had a wonderful week. It has been beautiful here but a bit rainy, too. At least we are not suffering from a drought. The round monogram is ongoing. Once the monogram was digitized, I put it into my new digitizing program to get the direction of the stitches correct. The new program tore the design apart and caused some unsightly and noticeable overlaps. I ended up re-digitizing the entire design in the new program and that worked very well. I need to learn the new program anyway. I did a stitch-out of the design and it turned out beautiful. A picture was sent to the client who loved it. Then I noticed that there are places where the fabric is showing through the stitches. The thread was almost too loose, so that’s not the problem. The problem is probably the pile of the fabric. To resolve the issue I need to use a wash away topping. This is upholstery fabric and I worried about water marks. Luckily, the customer left some scrap fabric and I embroidered a design on the scrap using the wash-away and then washed the topping away. After the swatch dried, there were no water marks. Hooray! As a side note to the round monogram story, the customer asked the name of the font that we used because a friend wants to match the monogram with her own monogrammed headboard. Unfortunately, we used a bit of this font and a bit of that font and in the end the monogram was digitized to fit a circle. The answer to her question is it is whatever she would like to name the font. We created it and it is truly one of a kind. Last year a gentleman approached me and asked if we would do tee shirts, hats, etc., for a television program that he produced called Senior Extremers. We agreed and filled the order. This year we were asked by this same gentleman to fill an order for Florida’s Surfing History, Part I. We have filled most of the order. I did not see the film when it debuted in downtown Pensacola and was surprised when I received a free copy of the DVD. George and I watched and found it to be a very well done documentary and we learned a lot about how surfing came to Pensacola Beach and how it has progressed. Many of the old timers were interviewed and others mentioned. The documentary is filled with fascinating stories of surfing at Pensacola Beach. If you get a chance to see this documentary, you really should, especially if you have been in Pensacola long enough to get a flavor of our beach and beach people. The baby blanket was finished and the blanket, bibs and other items were mailed to my granddaughter in Wimauma. Makayla’s due date is August 2nd, which just happens to be Keenia’s birthday, as well. Poor baby, Keenia says she is very tired and ready for this pregnancy to be over. I thought neutering your dog made him calm down. Not so in our Sam’s case. He has been running like all get out every day since his surgery. He has also been popping his lips and making funny sounds. I think he is doing that because we hush him up when he barks too much. Instead of barking, he pops his lips. He is one funny dog. I imagine, if you had to do it. Jesse was a chicken plucker. That's right. Jesse didn't think he was much of a person. Jesse's older brother wasn't much better. And he thought life didn't hold much hope for him. That sure didn't help the situation any. Put him in the entertainment corps. and become one of the best-loved characters of all time in doing it! into a successful career, still holds the record for the most Emmy's given in a single category. Could I be back on schedule? Well, it is still Friday. A really nice lady contacted me awhile back to do a monogram on a headboard cover. We met this week. She wanted the three letter monogram with one letter from this font and the other letter from that font and the last letter from another font. After looking at the monogram, which will be 11” to 12” tall, she still wasn’t satisfied and asked that we get the monogram to form a circle. No, she doesn’t want the letters inside of an embroidered circle. She wants the letters themselves to form a circle. The only way I know to do this is to digitize the entire monogram, which I did. I actually created an embroidered circle the size required. Then I placed the monogram inside the circle. The monogram was then digitized to touch the width and height of the circle. The digitized circle was then removed, leaving a perfectly round monogram. Cool, huh? I thought so. My son called this week asking if I had made our great granddaughter a blanket, as promised. I guess the family is getting nervous because our due date is the first part of August. I told him that I’d get around to it. Hank will be a granddaddy for the first time. We have a stock design for a baby bib which I did embroider but it looks teeny tiny and I hesitate to send it because it looks like something that would fit a doll. Then I realized that it has been a long time since I’ve had a newborn. In fact, it has been 40 years ago. Nevertheless, they don’t stay that small for long. Several months ago I found an online pattern for a baby bib and made a few to sell on Etsy. With the new machine and the super duper hoops, a full size baby bib should fit in the hoop. I set to work digitizing the baby bib using the dimensions from the pattern. It wasn’t too hard to do. First, I digitized a rectangle 11” x 9” with rounded corners. Then I digitized a circle for the neck, 4” diameter. Next were two small satin stitched lines from the upper part of the circle to the outer edge of the rectangle. Finally, two eyelets were inserted, using the boring needles, of course. When choosing the fabric it became apparent that one ply of fabric would not be thick enough. Also, the bib should not be bulky. Two ply of fabric was perfect. A sheet of tear-away stabilizer was hooped and the first round of stitching began for placement of the fabric. Then another round of stitching was placed to tack down the fabric. The fabric was then at a point to cut away the excess. Finally, the satin stitching was laid around the bib and the neck hole began stitching. There were a few adjustments required for the eyelets. The bib turned out beautiful. Next came the monogram. We have so many different styles of monograms that it takes hours to go through them. Most of the monograms I’ve never used. I picked an art deco monogram for the first one. It turned out so pretty. Since there are two plies of fabric, the bib is actually reversible. Creating these in-the-hoop bibs was so much fun. The fabric stash was flying because I was going through looking for something cute for each bib. Each bib has a different monogram. These just turned out adorable. I want to make more. Bib making had to stop because I really did promise a baby blanket. In fact, my granddaughter, Shakenia, said the colors would be purple and pink. The fabric stash had the perfect piece of dark purple, cotton fabric which I laundered and folded and it has been sitting on a stool for several weeks. This is MY great grandbaby. I want this blanket to be different and beautiful. While I was perusing the monograms, I ran across one that jumped out and said, “This is it.” Once that was embroidered on the top fabric, I just wanted to stop and sew up the blanket. It was, at least to me, breathtakingly beautiful. I also decided that I’m making on for me, too. The more I stared at it, the more I realized that I need this to at least hint that it is a baby blanket. The search began in our children’s stock designs. A cute little bird on a branch popped out and caught my attention. I played around with the design a bit. Some duplication was done. In the end it was a row of birds on branches. Four rows were embroidered; one on top, bottom, left and right of the name. That’s where I’m at now. I’m thinking about finishing the blanket. The back will be a piece of tan colored muslin. Then begin the quilting. Guess we’ll just have to wait and see what happens with it. Yesterday, our precious puppy, Sam, was neutered. George took him to the vet’s in the morning and we picked him up around 4:00. He now weights 68 pounds and still growing. He has his own bottle of pain pills. The vet tech said he was the singer in the kennel yesterday. Dogs are pretty darn resilient. He came home and wanted to play. He did sleep and lay around more than is normal for Sam. Today, he is back in full force. At one point today, I looked out the window and found Sam and Evie laying side-by-side outside. That has never happened. I had to take a picture but when I went outside the camera lens fogged up. I kept wiping it and it kept fogging up. I did get one or two clear pictures, though. I guess Evie decided she would be his nurse or mama. They have certainly bonded. The canopy finally came down yesterday. Every time we were ready to take it down and bring it inside, it would rain. One of our neighbors claimed the canopy was causing the rain. It is down now and by golly, it rained this evening. Now you know why some people are where they are! A successful attorney parked his brand new Lexus in front of his office, ready to show it off to his colleagues. As he was getting out, a truck came along too closely and completely tore off the driver's door. Fortunately, a cop in a police car was close enough to see the accident and pulled up behind the Lexus with his lights flashing. Before the cop had a chance to ask any questions, the attorney started screaming hysterically about how his Lexus, which he had just purchased the day before, was completely ruined and would never be the same, no matter how any car body shop tried to make it new again. After the lawyer finally wound down from his rant, the cop shook his head in disbelief. "I can't believe how materialistic you lawyers are," he said. "You are so focused on your possessions that you neglect the most important things in life." The cop replied, "Don't you even realize that your left arm is missing? It was severed when the truck hit you!" "OH, MY GOD!!!" screamed the lawyer. Did you miss me? I know. I should have emailed last week to say there was not going to be a Cajun Corner. I really thought I would write one but Friday turned into Saturday and before you know it, it is today. The week before the 4th of July was very busy. You see, we planned a party for the 4th under our Live Oak tree. A simple 4th of July party turned into quite the ordeal. Since we knew it would be hot during the day and guests were invited to arrive between noon and 1:00 p.m., we decided to put the Cajun Stitchery canopy up for additional shade. Since we were doing that, we might as well use the Cajun Stitchery folding tables for the food. Since we were going to put the food outside, we needed some sort of cover so the bugs, birds and critters would not devour our food before we could eat it. I decided to make a food tent. I think I mentioned the food tent idea in the last issue. The pile of old blue jeans were ripped apart and cut and sewn to make a huge role of six inch wide bias tape. George built the frame for the food tent our of PVC pipe. He actually built two of them; one for each table. The fiberglass screen came in the size of 48” wide and 84” long. We placed the screen over the frame and I fiddled around with it, placing pins where needed and up the stairs I went to see Doris in her sewing machine capacity. Up and down the stairs in my off hours were spent creating the tent. The screen wasn’t long enough and I had to take part of another role of screen. That’s what we bought it for. Once the screen part of the tent was sewn, the blue jean bias tape was pinned and then stitched around the bottom. The pieces of the blue jeans which are the seams were perfect for ties. The front of the screen was cut up to the middle to create a flap opening for getting the food. Then the flap required more bias tape. It looked very nice. I ran out of time in the middle of attaching the ties. We did put the food tent out and I pinned ties where needed. Dollar Tree was our source of decorations and we were red, white and blue everywhere. The menu was going to be barbeque beef sandwiches, hot dogs, potato salad, and apple pie with vanilla ice cream. The recipes came from allrecipes.com. George did most of the shopping during the weekend while I was working on some rush orders for Cajun Stitchery. Tuesday was filled with cooking and cleaning the house. I was still working on the food tent Tuesday night. Wednesday morning arrived and the bbq sauce was made. I had seen some real neat ideas for watermelon on Pinterest. George got 2 watermelons and Wednesday morning I began carving the watermelons. The first one was to cut the rind of the watermelon into the shape of a basket. I used a magic marker to draw the lines and then carefully cut the shape with a knife. Then all of the fruit was scooped out. It turned out really cute. 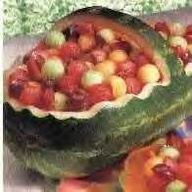 The watermelon was then filled with watermelon pieces, cantaloupe pieces, and blueberries. To top it off, I added toothpicks with little USA flags on them. The second watermelon idea also came from Pinterest. The idea is to stand the watermelon on end, cut off the top, scoop out the fruit and fill with ginger ale mixed with the watermelon juice. I looked at that watermelon and knew there was going to be a disaster if I stood that thing on end. Instead, the watermelon was placed on its side and an oval lid was carved out of the top. The fruit was scooped out and the lid replaced. I decided to wait until the party began before adding the ginger ale. Guests were bringing bean salad, coleslaw, baked beans, potato chips, and a neighbor brought over a cake with the icing design of the US flag. The canopy and tables were placed under the tree. The food tent was placed on the longer table. As the guests began to arrive, so did the rain. In all we had 16 people in attendance. Most were in my kitchen. By the time we were ready to eat; we just ate in the kitchen and had a wonderful time. A few were sitting on lawn chairs under the canopy. After we ate, the rain subsided. We spent the rest of the afternoon under the canopy. Never even put the food outside. Everyone just went into the house to get food when they wanted some. There was so much food and everyone loved the barbeque beef. There simply was no need to cook the hot dogs. Insofar as the watermelons were concerned, we all ate some of the fruit but the watermelon with the ginger ale turned out to be unnecessary and one watermelon too much. We have bags and bags of fruit in the refrigerator. In fact, George and I have eaten leftovers every night since the party. It was a fun party. Everyone seemed to enjoy themselves. I totally forgot to tell everyone that we had vanilla ice cream for the pie. After everyone left, George and I just kind of crashed in front of the television for the evening. Thursday brought a couple of customer appointments and an order for labels. George decided that the canopy and food tent should stay outside to dry in the heat all day. It isn’t good to pack these things away when they are wet. When I awoke on Friday we were having quite the lightning storm. The canopy and food tent got wet, again. Our power went out and was out for 11 hours. George and I played cards and took lots of naps. There really wasn’t much else for us to do. Although we were anxious to get the power back on, I think our bodies needed the rest. Despite all of the naps of the day, at bedtime we both fell fast asleep without a problem. Today, the canopy and food tent were still outside drying. Sure hope it doesn’t rain tomorrow. The shabby chic, ruffled purse with flowers and rhinestones that was listed in our Etsy Store for $10 has been sold. Sprawling over a million-acre swath of southern Louisiana, the Atchafalaya River Basin is the largest swamp in the United States and one of the country's most ecologically varied regions. Its wetlands, bayous and marshes are home to 300 species of birds, 90 species of fish and shellfish and 54 species of reptiles and amphibians, including the great American alligator. It owes much of its haunting and mysterious beauty to the towering, moss-draped bald cypress trees that thrive in its swamp waters. For hundreds of years, the Basin's human dwellers—from the Native Americans who harvested its timber to the present-day Cajuns who hunt alligators in its murky depths—have subsisted on its many bountiful resources. In the second half of the 18th century, the region became a refuge for several thousand French colonists who had been expelled from Acadie, part of present-day Nova Scotia, for refusing to swear allegiance to the British crown and church. Known as the Acadians, the settlers adapted their way of life to the changeable nature of the Basin's wetland environment, where water levels fluctuate depending on the season, by favoring houseboats and campsites to more permanent homes. Many began growing sugarcane and other crops in the fertile bayou soil, while others made a living as loggers, hunters, trappers or fishermen. The Acadian community grew and prospered, eventually giving birth to the distinctly Louisianan "Cajun" culture, known throughout the world for its food, music and unique dialect. Today, the Cajuns make up a significant part of southern Louisiana's population, and many continue to embrace the lifestyle and traditions of their ancestors. In spite of the region's natural bounty and unmistakable splendor, swamp living has never been easy for the Cajuns and other residents of the Atchafalaya Basin. For instance, the disastrous Great Flood of 1927 decimated many communities, sparking a mass exodus that dramatically reduced the region's population. But to many people born and raised in the cradle of the lush and majestic Atchafalaya, the dangers and challenges they face are an accepted–and even welcome–part of life.